Mumbai (or Bombay as it is still known to many locals) has its own patron saint. 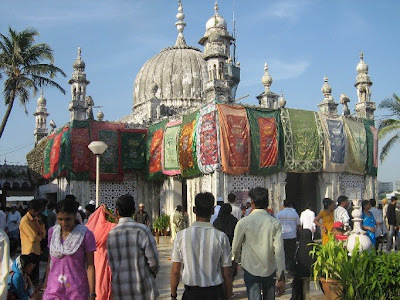 Each day thousands of locals of all faiths, creeds and castes visit the shrine of Piya Haji Ali, a complex located on a small islet within view of Mumbai's skyscrapers. The Piya Haji Ali Dargah was first built in 1431, and seems almost immersed in the ocean. Devotees' visits are generally limited to low tide. The shrine is a tribute to India's uniquely religious form of secularism, a tradition of rick spirituality in which people of all faiths share a devotion of common saints. The first video shows devotees visiting the shrine, and features background music from the late Nusrat Fateh Ali Khan, a Pakistani sufi singer admired across the subcontinent and the world. The seoond video is a track from a Bollywood film written by legendary Indian musician AR Rahman.